next post: Madame Lagarde basically says MMT is correct – not that she knew she was saying it! I was sent two papers by Thomas Palley the other day. I have known him for decades. He continually disappoints. He has become one of those self-styled Post Keynesians who are trying to destroy the credibility of Modern Monetary Theory (MMT) for reasons that are not entirely clear although I know things I won’t write here. He thinks that if he drops a reference to Michał Kalecki, the Polish Marxist economist, into a paper, it qualifies one as being Post Keynesian. But, the reality is that his work (what limited academic work that he has published) sits squarely in the Neoclassical IS-LM synthesis tradition, which is not Post Keynesian nor heterodox at all. It is the antithesis of Post Keynesian. So I have never understood how he wants to appear Post Keynesian. Anyway whatever the answer to that little puzzle is, he definitely has a set on MMT and regularly recycles the same sorts of attacks, which, continue to have the same problems. In other words, he does not seem to (or does not want to) learn. He also accuses those who respond of dishonesty – playing the pure is me card – although his own work on MMT fails, in part, because he deliberately (or not) refuses to acknowledge the extant MMT literature, which addresses the issues he claims are missing in the MMT approach. Go figure! 1. What’s Wrong With Modern Money Theory (MMT): A Critical Primer (April 10, 2019). 2. Macroeconomics vs. Modern Money Theory: Some Unpleasant Keynesian Arithmetic (April 4, 2019). I don’t think they are worth reading but they do allow me to make some points that regular readers often ask about. Your blog post is misleading to the point of being dishonest. I didn’t find anything misleading at all with Lars P. Syll’s short overview of the problems in Palley’s work. Further, if you consult the reference list in both Palley papers above you will, curiously, find my own name missing. Now I am not precious about that. But as the person who has written the most of anyone about MMT over the last 25 years, and, being one of the original academic developers of the work, one would think that at least one of my articles, books, blog posts, Op Ed articles would appear in a piece of work which claims to be “A Critical Primer”. The reason this is significant is that many of the deficiencies he claims render MMT useless have actually been dealt with in detail in my own work and less so in the work of other MMT academic writers. Which is not to criticise my MMT colleagues. We all contribute in different ways. So I am then wondering. Has Palley not read my work? … a strong advocate of the traditional Phillips curve. Which, for anyone who has read my academic work, including my earliest articles, my PhD dissertation and countless other writings, would know, that I have opposed the traditional Phillips curve conception and presented alternative depictions (based on buffer stocks and hysteresis). The next option, then, is that Palley has decided not to reference my work because he knows that would significantly compromise his case to the point of rendering his attack on MMT a non-starter. The selective quoting of literature is, in fact, the exemplar of the way academics construct dishonest scholarship. Not that Palley is working in an academic post (despite trying). As regards injecting state money to pay taxes, MMT is strictly wrong with its claim that the public cannot pay taxes until government has first spent. In fact, the central bank is the source of such money. It can inject money into the system by buying existing government bonds, buying private sector assets, or by lending to private banks. Moreover, under the current system, the central bank can increase the money stock by paying interest on existing money balances. That means government spending is not the only way to get state money to pay taxes into the system. So did we actually miss that reality? 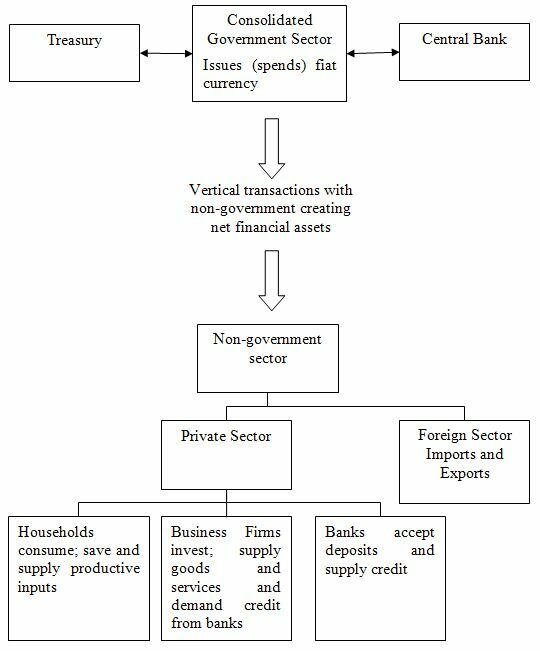 For example, in a 2005 Centre of Full Employment and Equity (CofFEE) Working Paper – Essential elements of a modern monetary economy with applications to social security privatisation and the intergenerational debate – we produced two diagrams. That is, way back then. 1. Deficit spending 101 – Part 1 (February 21, 2009). 2. Deficit spending 101 – Part 2 (February 23, 2009). 3. Deficit spending 101 – Part 3 (March 2, 2009). Here are the diagrams for reference. They were reproduced again in our new textbook – Macroeconomics – with further discussion. These diagrams are core MMT. 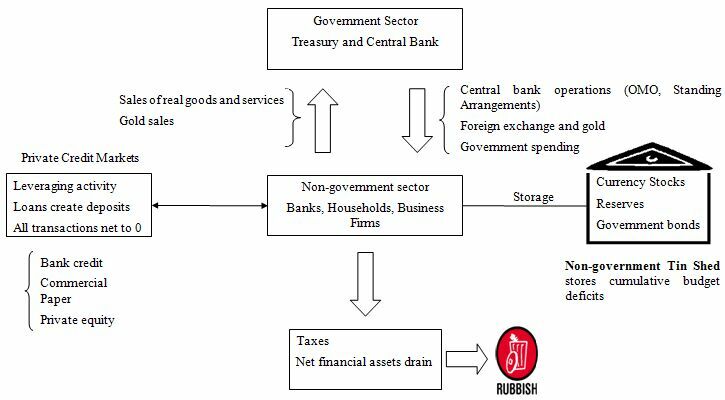 Both diagrams and the related discussion acknowledge the Government sector is the sum of the Treasury and Central Bank. 1. Central bank operations (Open Market Operations, Standing Arrangements). 2. Foreign exchange and gold transactions by the central bank. MMT has never been “strictly wrong” on this issue. From the outset we recognised the dual role of the government macroeconomic institutions (Treasury and Central Bank). So why would he write that? Ignorance? Vindictiveness? All he does is make a fool of himself and discredits his professional standing. MMT objects to its being called a constraint as if government were a household. However, that is a terminological objection. Moreover, Old Keynesians also recognized it was not a constraint and referred to it as the budget identity or budget restraint. More generally, it is pure semantics whether taxes raise money to finance government spending, or taxes destroy money in order to create the space for reissue of money to finance spending. The second quote comes after a section berating MMT for being politically naive. Terminology, semantics matter a lot in framing arguments and educational dissemination. Take the first of these quotes. First, the issue about “Old Keynesians” is important because it means Palley has not understood what happened in August 1971 in his own nation (the US). At that point, all of the “Old Keynesian” analysis about government fiscal restraints became moot because governments around the world freed fiscal policy by floating their exchange rates and introducing fiat currencies. The abandonment of convertibility (and the gold window) was a major turning point in monetary history, which apparently escapes Palley’s comprehension. Second, it is no meagre terminological difference to construct a fiat currency-issuing government as a household in the way mainstream macroeconomics does and to break with that construction in the way MMT does. The behaviour and possibilities of a currency issuer are not comparable to those of a currency user. Our perception of what is possible for a currency issuer cannot be informed by our experiences as a currency user. A household cannot buy whatever is for sale in the currency it uses. A currency-issuing government can, if it chooses, any time it wants. Clearly there are consequences in doing that but the point is that it can. That opens up a completely different dialogue about what our elected governments might do to advance public well-being. An appreciation of that difference allows us to reject a political narrative that says we have to tolerate mass unemployment because the government hasn’t the capacity to provide sufficient work. Once we understand that the government can create sufficient work then the political options broaden and the quality of our democracies rises – there is more accountability, for example. So framing and language matter and one of the things that the core MMT group has been mindful of and intent on ensuring is that these conceptual points are clear in peoples’ minds. Leaving aside considerations relating to the allocative reasons for taxes (such as imposts on alcohol and tobacco for health reasons), there is nothing semantic at all between an awareness that we are paying taxes to a government in order that it can then provide public services and infrastructure (for example) against the reality that those taxes are not paying for public expenditure. A public that thinks that its taxation payments are funding public services is an ignorant public and will therefore be susceptible to spurious arguments from politicians, which justify policies that undermine well-being but are presented within the TINA frame. I could construct many examples of how it would dramatically change the political debate if the public understood the way governments spend, the capacities the currency-issuing government has, and the role that taxes actually play in the system. We could actually focus on class struggle more squarely by talking about power in relation to issues relating to increased taxes on the rich, instead of falling into the mythical story that the rich are somehow important for funding public services, which is the current way ignorant progressives are talking. I consider class struggle further below. Palley wrote in 2013 that MMT “failed woefully” because it did not have an inflation analysis. I responded to that criticism in this blog post – I wonder what the hell I have been writing all these years (February 12, 2013). At the time, it was a ridiculous claim that suggested he had read very little of our work or was just being a vindictive or both. Inflation is therefore presented as a “threshold” problem, but that is not how inflation develops in the real world. Instead, the economy consists of multiple sectors, and some hit the full employment barrier before others. Consequently, inflation starts bubbling up before there is aggregate full employment, and government lacks the capacity to target its demand injections sector by sector and market by market. This is just a rehashed point from his 2013 critique which I addressed in the blog post cited immediately above. But it made me wonder – what were all those articles and a few of the books I have written actually about. I had thought they were about inflation, bargaining conflict, the battle of mark-ups, imported inflation via resource prices; incomes policy and indexation, and the Phillips curve and related articles – some with mathematics, many with the latest econometric modelling. Further, in our new textbook – Macroeconomics – we summarise a lot of our past work on inflation and costs in the Chapters on Aggregate Supply (Chapter 16), and, in Chapter 17 Unemployment and Inflation. I had written draft sections of this in early 2013. But much of the material goes back to my published work starting in 1987 and continuing from there. 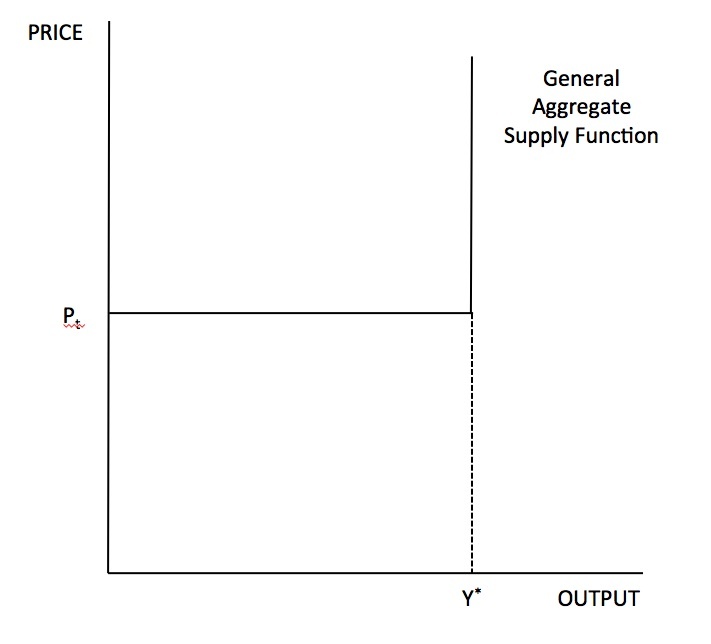 In the textbook, we initially present the L-shaped aggregate supply (AS) schedule as below, which is a simple beginner’s approach to understanding the difference between a quantity-adjusting economy (horizontal supply curve) and a price-adjusting economy (vertical supply curve). This is Figure 16.3 in our new textbook (and also appeared in our previous introductory book published in 2016 and now withdrawn from sale). This is the “threshold” type schema. The right angle point is the threshold between those two different types of adjustment responses to increases in nominal aggregate spending. … all firms are unlikely to hit full capacity simultaneously. The reverse L- shape simplifies the analysis somewhat by assuming that the capacity constraint is reached by all firms at the same time. In reality, bottlenecks in production are likely to occur in some sectors before others and so cost pressures will begin to mount before the overall full capacity output is reached. This could be captured in Figure 16.3 by some curvature near Y*, thus eliminating the right-angle as prices begin to rise before reaching Y* (full capacity). We consider this issue in more detail in Chapter 17. In Chapter 17, further discussion takes place along these lines. So you have to ask yourself – how can “A Critical Primer” be critical if the substance of the criticism has already been dealt with in full along the lines of the criticism? The implication of this is obvious: He either hasn’t read much and therefore should not be holding himself out as any sort of expert on the matter or he has deliberately avoided referring to those sections of our work that are inconvenient for his vindictiveness, which disqualifies him through a lack of credibility. Noticeably absent in the MMT discourse are the issues of income distribution and class conflict. Consequently, from an MMT perspective there is no economic need to address income distribution, and nor does class conflict pose a problem for government’s ability to do as it wishes regarding spending and taxes. He is trying to place himself in the same camp as the Marxists who criticise our work and I addressed some of their issues in this blog post – The conga line of MMT critics – marching into oblivion (March 7, 2019). One doesn’t have to search very hard to see that in my own work class struggle has been an important organising concept. For example, this blog post – We need to read Karl Marx (August 30, 2011). Several academic articles I have published and – Full Employment abandoned (Edward Elgar, 2008) and Reclaiming the State: A Progressive Vision of Sovereignty for a Post-Neoliberal World (Pluto Books, 2017) all consider class as a major organising framework, within which, one should situate Modern Monetary Theory (MMT). Our new textbook has a lot of discussion about class conflict and its implications for the distribution of income. The Chapter on Inflation builds a theory of inflation based on class struggle over the distribution of national income. There is a section in one chapter on theories of profits and this discussion is explicitly conducted within the context of class struggle. Here is a sample of the index. If my eyes are not deceiving me it looks like there is discussion about “class struggle”, “crises”, “capitalist production” etc. The textbook is recent but contains material that draws on decades of work by Randy Wray and myself (with help from Martin Watts). In many of my articles I construct an understanding of the monetary system within the context of the struggle between labour and capital. My Phd centred on that struggle. My early 1998 article on Modern Monetary Theory (MMT) considers class and class power. Palley either hasn’t read my work or deliberately avoids citing it. That is not the behaviour of a person acting in good faith. Palley’s second paper – Macroeconomics vs. Modern Money Theory: Some Unpleasant Keynesian Arithmetic – covers the proposals for Green New Deal in the US. The nub of the paper (to save you reading it) is that the GND, as enunciated by the proponents (even though it is still lacking operational detail), would be a very large intervention and would imply a significant fiscal shift. He asserts there would be “a final increase in AD of 17.0 per cent of GDP” (AD is aggregate demand or spending). Whether that number is accurate is not the point. We can agree that the GND in its totally would be a large shift in public spending. He then says that the labour market impacts of that shift would “likely … produce high inflation” and that the central bank could “spike interest rates to control AD”. But he notes that “MMT proponents … reject using interest rate policy to fine tune the economy”. Which is an accurate statement given how ineffective interest rate management is in accomplishing that task. So then Palley claims in these situations “the inflation situation would be even more dire”. As a result, he argues that major tax increases would be required (“a 78 per cent increase in the federal tax take and fee take”). Again, whether that piece of arithmetic is accurate is not the point here. His point is that either way – interest rate rises or tax hikes – the political costs that would arise from the anti-inflationary policies would damage the progressive movement. MMT proponents are now asserting society can enjoy a range of large government spending programs for free via money financed deficits, which has made it very popular with progressive policy advocates. That is a dishonest representation. I would forgive a non-economist, not trained in concepts such as opportunity cost etc ,if they had made that statement. A non-economist is so conditioned by the faux statements of politicians, mainstream economists, and financial media types to associate ‘cost’ with numbers placed in government fiscal documents that they might use the term ‘free’ inappropriately. No MMT proponent thinks a government program is ‘free’ in the sense that real resources have to be harnessed to make the program operation. The larger the program, the greater the stress of real resources. Ultimately, when resources are finite political decisions have to be made by government as to which sector uses them. If the government determines that its political mandate requires more public use and less private use, then fiscal policy has to be used to ensure that the private sector can spend less. And here is another blog post (of many) that consider ‘costs’ – British Labour has to break out of the neo-liberal ‘cost’ framing trap (April 12, 2017). I wrote that if, for example, we were to take a public employment program that required government to spend $x billion in wages, capital equipment, administration and oversight, we might reasonably ask about the cost of that program. The conservative frame tells us that the cost is $x (the figure that appears in the annual fiscal documents against the program). An MMT frame considers the $x in the fiscal papers to be of little interest. The actual cost of the program is the change it causes in the usage of real resources – more consumption by the unemployed workers, some equipment etc. An additional cost would be the opportunity costs of such a program, which are minimal, given the unemployed are idle. In fact, in this frame, the increased use of the real resources provides benefits to both the individuals and for society so the use of the term ‘cost’ would be misleading. When we ask whether the nation can afford a policy initiative, we should ignore the $x and consider what real resources are available and the potential benefits. The available real resources constitute the fiscal space. The fiscal space should then always be related to the purposes to which we aspire, and the destination we wish to reach. So if the economy is at full employment, then political decisions have to be made about whether the nation needs more real resources being diverted into, say, health care and less into bombing the hell out of Iraq or wherever the bombs are falling now. The national government is never revenue constrained because it is the monopoly issuer of the currency. So it can buy whatever real resources that are for sale in the currency it issues. Which means that it the nation determines through the political process to drop bombs and leave sick people sick then it can financially accomplish that goal without issue. So it is plainly false to claim that the MMT proponents have not considered these issues and just think there is a ‘free lunch’. Palley’s poor form is exemplified when he quotes some other article from Max B. Sawicky, who I generally find to be reasonable. The article (January 4, 2019) – The Best Way To Argue Against PAYGO – discusses the ‘paygo’ debate in the US. But at some point, increased government spending runs up against that capacity constraint. If we are already at full employment, with full utilization of all productive resources, more deficit spending can result in undesirable inflation. The above is, in fact, MMT doctrine, but often hard to find in their popular treatments. Note the distinction between “MMT doctrine” (which is the body of literature that the core MMT group has developed over the last 25 years) and the “popular treatments” (which I take to mean the derivative versions of our work by other writers who may or may not be sympathetic to the “doctrine”. I don’t use the term ‘doctrine’ to describe our core work. It is a body of knowledge that has stood the empirical tests and is the best explanatory framework currently on offer for people to use to understand how the monetary system operates. But that beside, the distinction is very important and refutes Palley’s entire argument that MMT advocates ‘free’ spending, despite him using other quotes in the article (out of context) to criticise our work. I wrote about the GND in this blog post – The erroneous ‘lets have a little, some or no MMT’ narrative (February 20, 2019). I wrote that the debate should be focused on what a GND means for real resource usage and what redistributions of access to real resources might be required to ensure that total spending (on the available real resources) can accomplish the GND goals without accelerating inflation. Those redistributions of access is just another way of saying – if the current real resource usage is leaving a stock of free or underutilised real resources that is smaller than those required to effectively implement a GND – then the government has to increase that stock by depriving some of the current usages access. One way to do that is through taxation – which reduces the capacity of the non-government sector to utilise real resources (by reducing spending capacity). There are other ways including through regulation. However, it is important to understand, that if taxes are raised to build a stock of free resources that can be then redirected into productive use via the GND, this has nothing to do with ‘funding’ the spending outlays that are operationalising the GND. Once you fall into the ‘funding’ narrative you have left MMT thinking and gone back to neoliberalism. My other recent post on the GND – The Job Guarantee is more than a Green New Deal job creation policy (December 17, 2018) – is critical of those who only see the GND in cyclical terms, as Palley seems to do. The original New Deal during the Great Depression (specifically, the relief and recovery elements) was largely concerned with implementing what macroeconomists refer to as a ‘counter-cyclical’ fiscal intervention – working to redress non-government spending shortages, which leads firms to lay-off workers. These expenditure initiatives are not intended to be permanent supports to regions and communities. As non-government spending returns, the fiscal intervention is withdrawn. But, while the details are to be provided, the ‘Green New Deal’ proposal is not really (primarily) about resolving a cyclical shortfall in aggregate spending. Rather it is a structural program designed to significantly change the patterns of industry output, employment and the consumption patterns of households and firms. And further, it is about fundamentally altering the shifting the line between government and market responsibility for resource allocation both in aggregate but also spatially. This shift would go much further than a stimulus package for some regional areas. It would involve a fundamental reconfiguration of the concept of government in the US context, going against the historical norms that have dominated American society since its inception. Which means that the way in which the expenditure is introduced and the accompanying policies to ensure that there is sufficient real resource space to accommodate that new GND expenditure are likely to be different to a purely counter-cyclical stimulus approach. Palley doesn’t consider that at all. He clearly has decided to ignore many articles I have written on these issues, which counter his facile stylisation of MMT. He just wants people to think that MMT claims “that the US can enjoy a massive permanent money financed program spree that does not cause inflation”. That might make him feel important. But it certainly doesn’t help him establish the credibility he has so sorely desired over the years but never seems to find. I only decided to explicitly address the Palley papers, not because they are important in any way, but because some of the points are still raised in E-mails I receive from readers who are acting in good faith. I get many E-mails with many questions. And the topics above reflect many of those queries. But you can see why Palley avoids citing my work – because I have already written the stuff he claims MMT ignores! So, Tom, you can do better than the pathetic stuff you are pumping out at present. It doesn’t help your standing at all. Superb blog post today! A model of clarity and rational thinking. What a joy to read something that refreshes the channels of thought which are pummeled every moment by inherited misconceptions of our daily lives and culture. The constant misuse of ‘costs’ and ‘nominal amounts’ and the deprecatory use of the word ‘free’ need constant challenging and this blog post provides us ‘amateur’ MMTers out here with valuable insights into this framing. One question: How does the Central Bank purchase of gold increase vertical currency issuance? Given that the gold is not ‘baking’ anything? 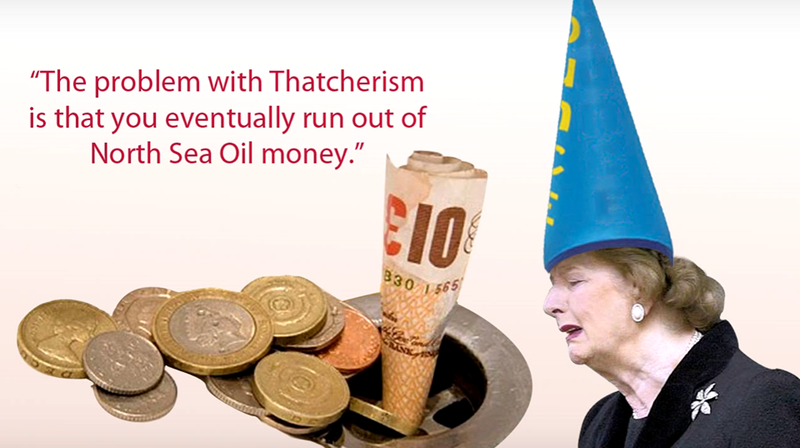 @Kevin, TINA = There Is No Alternative – characterised Thatcherite policies. Thanks, Carol. Awww, we pickin’ on po’ Maggie? To Kevin: “TINA” = “There Is No Alternative”, referring to the particular neoliberal approach to policy argument in which there are precisely two alternatives available, their preferred policy and something constructed to be a catastrophic disaster, so everyone is supposed to conclude that “There Is No Alternative” but to follow their policy advice if they want to avert disaster. Most commonly attributed to Margaret Thatcher’s UK governments of the 80’s, but generally refers to the idea that once you’ve (falsely) equated government finances to that of a household or business, then in response to a budget deficit the government has ‘no alterantive’ but to cut spending in response. So generally now, the phrase ‘TINA framework’ is used as shorthand for the whole (false) logic used to justify austerity policies. Nice article Bill. In my view, there are two basic arguments at work here. The academic macro one which MMT is going to win and then the political one which is within the political corridor and may be more difficult to win. If I could give a thought experiment. Bernie Sanders says he’s going to tax the rich, and lets the general public believe those taxes somehow ‘pay’ for a program people desire. He knows better, Stephanie Kelton has already explained this to him. Is it more helpful politically, at least initially, to allow this misunderstanding to persist? As an academic, do you consider this to be a ‘political’ power question that is outside the academic arena? I can envision (I may be delusional) a scenario where MMT is the driving economic narrative, but politically it is useful for the public to accept higher taxes because the rich are, well, too rich: A moral argument that falls just short of understanding that taxes disappear alongside the IOU and don’t really fund anything. I know this is ‘sideways’ to the core academic. But in politics, it seems sometimes that ‘sideways’ is the only way to get there. A topical current version would be “Brexit is impossible”. I believe that using terms pertaining to an old hypothesis in order to help others break free from that old hypothesis is a valid strategy. Finding points of common understanding is important in gaining trust and empathy. There is nothing to be gained by alienating people before one has an opportunity to deliver a key message. Isn’t buying treasury security just an asset swap, so you are not really injecting net money. Lending to private banks doesn’t really make them lend to the economy in general. Besides, do we even want them to keep lending considering the current debt pollution in western economies? I think Palley is just trying to save face for mainstream economics because they have devoted so much time into it–it can’t be wrong can it? The other thing about alot of people (even the people i look up to) is that when you talk about money as a public utility to facilitate real resources exchange and development, they become super defensive. They become defensive even when they are poor and even when we are spending trillions on useless bombings and bank bailouts. I sense some of that in Palley. He must make more salary than I do, but I feel that people like him are sort of controlled by money. People like him would rather let money and the dumb market to dictate their lives than taking control themselves and use money to promote the public purpose. This article explains the ISLM view of MMT in some detail without being overly wonkish for general accessibility. While it is sympathetic to MMT, it is still wrong, but instructively so. Assumptions die hard. Notice the assumptions about the effect of changes in “money supply” based on money supply being settlement balances in the payments system (“bank reserves balances”, abbreviated as “rb”). The effect of such changes in conventional economics is based upon assuming that changes in the amount of rb in the payments system (base money) are determinative of changes in the amount of “money” available for spending in the economy that affects “purchasing power” and therefore price level (inflation). This assumes a “money multiplier” that controls bank lending through the amount of bank reserves. The notion of the money multiplier has been debunked, but many conventional economists have not yet picked up on this. The concept of “crowding out” of investment assumes that government borrowing competes with private sector borrowing for investment. This assumes a fixed amount of “loanable funds” available for borrowing. This, too, has been debunked. In the first place, loans create deposits rather than deposits being necessary to extend credit. Secondly, government spending adds the precise amount that government injects into the economy after netting for taxes, which withdraw “money” from the economy (reduce deposits). The balance of the funds injected get transferred in the payments system from government liabilities of zero maturity (rb) to government liabilities of non-zero maturity (government securities usually lumped together as “bonds”). This drains the fiscal deficit from the payments system (monetary base) into government securities. Conventional economics assumes that issuance of government securities “neutralizes” the purchasing power of the net government injection from deficit spending, that is assumed to be otherwise potentially inflationary. But government securities do not prevent spending other their basis since they are highly negotiable and also prime collateral. So there is essentially no difference between issuing government securities to drain the monetary base and not doing so, other than the interest. It is done operationally in order to facilitate the central bank hitting its target rate when setting the interest rate and not setting to zero, or not paying interest on reserves. In short, issuance of government securities does not neutralize deficit spending as conventional economists assume it does. Conventional economists have monetary and fiscal operations and their effects wrong, so their analysis is without basis. But it is interesting to see how their analysis goes and this article may be useful in doing so. Hopefully, one of the MMT economists will pick up on this article and “fisk” it point by point. I seem to remember seeing somewhere that at least some among the then Pope’s advisers, being far from stupid, were perfectly capable of appreciating (and even that some may have privately acknowledged) that Galileo’s observations demonstrated incontrovertibly that the Earth and planets orbit the sun not vice versa, but despite that were no less determined that he must be silenced (by being shown the instruments of torture). For them, preservation of the infallibility of Catholic doctrine was all that mattered. Likewise, one might suspect that not a few of MMT’s most vocal critics are equally well aware that what MMT reveals about the real nature of our monetary system’s functioning (as opposed to the fictional way in which it is customarily presented) is incontrovertible, but that their primary concern is that that shall not become widely known. For them, preservation of the infallibility of what they teach, upon which their livelihoods and reputations depend, are all that matters. They will deploy all the means at their disposal (which Bill has catalogued) to achieve that aim. Fortunately, the threat of the rack is not among them (but I’ve little doubt that if it were they would use it). But back in the good old UK we have a malicious Tory government negotiating Brexit. The net result is horrible to imagine. Some of us would love a progressive enlightened left wing government to be doing this but we don’t have one which is why some on the left favour remaining in the EU. Such a shame. As for his first objection, it would be worth noting that, even if one would choose to see the Central Bank as an entity independent from the government, it is still a fact that their IOUs would be worthless if the fiscal authorities would not accept them as payment for taxes. Might be good for the MMT crew to make this point more often. I won’t presume to speak for Bill, but from what I recall reading here he has concerns about the framing that adoption of mainstream language around taxation and government funding (for political convenience) entails. Politics may be the art of the possible but if you use you use phrases like “spending tax payers’ money” or ‘tax and debt fund government expenditure” you are perpetuating the noeliberals’ falsehoods. You’re in a trap from which there is no escape. The point made by PhilipR gets to the nub of it. Why do you think the social democratic political parties have fallen into electoral disrepute over the last decades? I cannot see it can be a progressive position where a political party deliberately sets out to lie to the people and still claim they are part of a democratic process. I know ‘democracy’ is flawed but at the most elemental level it does require adults to make informed choices. A system where people are choosing between A and B based on a lie and ignorance is not akin to a democratic system, especially if the political elites know different and withhold the information for ‘political purposes’ from the public. Tell the truth and educate people to see the consequences of that truth would be my political approach. Bill, part of the reason for the resistance, besides the relief MMT gives to economic truth and justice, is for anyone in the field to accept it, it begs the question “Why didn’t you know about this?” and moving the mantle of expert authority from themselves to others. For people who have invested their lives in relative ignorance, don’t expect them to acknowledge their failures. there is nothing semantic at all between an awareness that we are paying taxes to a government in order that it can then provide public services and infrastructure (for example) against the reality that those taxes are not paying for public expenditure. Maybe I’m just a crotchety old formal logician, but I find this debating turn of phrase pretty offensive. What something means is important to policy development, even if the professional debater may find meaning inconvenient to their rhetorical flow. I would suggest the use of the word “rhetorical” rather than “semantic”: the disparaging intent should be aiming at mere word play rather than at genuine truth seeking. This is indeed something very very “semantic” about the distinction between taxes providing the money for government spending and taxes freeing the resources that government wishes to utilise. It is like the difference between pre and post-Newtonian mechanics. The difference between “I need to keep pushing it to keep it moving” and “I can keep it moving by reducing friction”. In spite of the hundreds of millions of euros raised (albeit by the private sector in donations) the real bottleneck was going to be caused by real world constraints, in particular the time required for structural survey and drying out, but also, critically, the shortage of skilled craftspeople to physically carry out the the repairs. In spite of the non-govt sector source of funding in this case, this to me demonstrates nonetheless that real resources are the constraints we face in the economy, and not, especially where sovereign govts are the funding source, financial ones. So not entirely a clear MMT-relevant example, but perhaps tangentially relevant?